How Can I Reduce My Risk For Having A Stroke? Some of the stroke risk factors may not be controllable and these include age, gender, family history, one’s race, and ethnicity. Fortunately, many of the risk factors can be controlled and managed since these are associated with one’s diet and lifestyle choices. A stroke (or a brain stroke) is a serious medical emergency situation when the blood supply to parts of the brain is blocked or reduced. This causes oxygen starvation or deprivation in the brain (or in parts of the brain), and the brain cells begin to die. 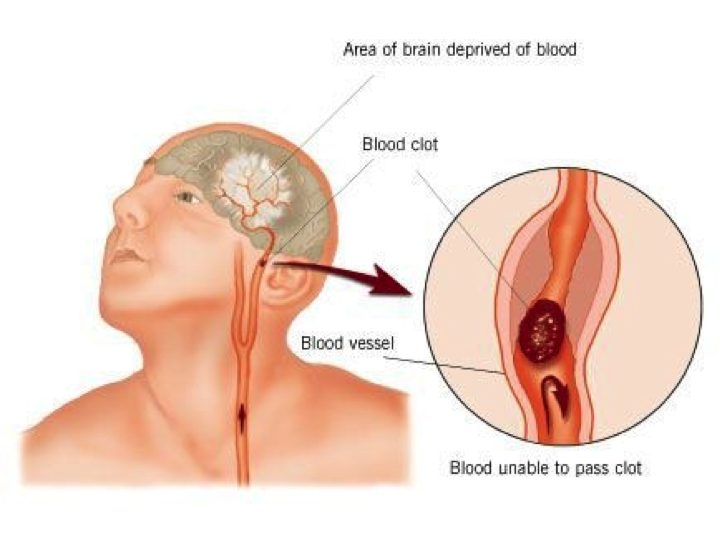 Due to this, parts of the body that are controlled by the affected portion of the brain cannot function properly; the degree of function lost is dependent upon the severity of the brain stroke. A brain stroke can impair functions, such as movement or mobility, due to paralysis of the muscles, speech and swallowing abilities, and memory. Severe strokes could result in permanent damage and long-term disability, or can often be fatal. Early medical intervention can help mitigate some of the damage caused to the brain; however, stroke symptoms often develop suddenly, without offering any warning signs. Medical advisers and healthcare institutions inform that the best way to prevent a stroke is by controlling or reducing the risk factors. High blood pressure is a key contributing factor for a stroke. It may be controlled or lowered by eating healthy ‘low cholesterol’ foods, reducing salt intake, quitting smoking, having an active physical life, and through prescribed medications. Overweight or obese individuals have an increased risk of stroke. In such cases, the avoidance of certain fatty foods and the involvement in physical activities and exercising can help bring down the weight to optimum required values. Getting more exercise and being physically active are positive health factors that lower one’s chances of a stroke. Studies have shown that even a low intensity exercise, like walking, can lower an individual’s risk for stroke. Limiting alcohol consumption or drinking to moderation can lower one’s risk for a brain stroke. According to Harvard Medical School, even having two drinks per day, instead of one drink, sharply increases stroke risk. Tobacco smoke contains many chemicals that aid in the formation of fatty deposits on the walls of the arteries that could lead to reduced blood flow to vital organs of the body (including the brain), a condition termed as atherosclerosis. When the brain receives less oxygen due to reduced blood supply, it results in a stroke. In the United States, the statistics on brain strokes are alarming. The National Center for Chronic Disease Prevention and Health Promotion (part of CDC) informs that each year there are nearly 800,000 stroke cases that result in 130,000 deaths. The publication mentions that individuals at severe risk of a stroke are those who smoke, have high blood pressure, and have high cholesterol levels. It was found that most individuals have at least one of these risk factors, apart from other unhealthy lifestyle choices. A 2014 report by the American Heart Association also says that the estimated cost of a stroke in the US annually is nearly $37 billion. Go, A. S., Hylek, E. M., Phillips, K. A., Chang, Y., Henault, L. E., Selby, J. V., & Singer, D. E. (2001). Prevalence of diagnosed atrial fibrillation in adults: national implications for rhythm management and stroke prevention: the AnTicoagulation and Risk Factors in Atrial Fibrillation (ATRIA) Study.Jama, 285(18), 2370-2375. Albers, G. W., Diener, H. C., Frison, L., Grind, M., Nevinson, M., Partridge, S., ... & Vahanian, A. (2005). Ximelagatran vs warfarin for stroke prevention in patients with nonvalvular atrial fibrillation: a randomized trial. Jama,293(6), 690-698. Toole, J. F., Malinow, M. R., Chambless, L. E., Spence, J. D., Pettigrew, L. C., Howard, V. J., ... & Stampfer, M. (2004). Lowering homocysteine in patients with ischemic stroke to prevent recurrent stroke, myocardial infarction, and death: the Vitamin Intervention for Stroke Prevention (VISP) randomized controlled trial. Jama, 291(5), 565-575. Holmes, D. R., Reddy, V. Y., Turi, Z. G., Doshi, S. K., Sievert, H., Buchbinder, M., ... & Protect AF Investigators. (2009). Percutaneous closure of the left atrial appendage versus warfarin therapy for prevention of stroke in patients with atrial fibrillation: a randomised non-inferiority trial. The Lancet,374(9689), 534-542. Amarenco, P., Labreuche, J., Lavallée, P., & Touboul, P. J. (2004). Statins in stroke prevention and carotid atherosclerosis systematic review and up-to-date meta-analysis. Stroke, 35(12), 2902-2909. Wang, X., Qin, X., Demirtas, H., Li, J., Mao, G., Huo, Y., ... & Xu, X. (2007). Efficacy of folic acid supplementation in stroke prevention: a meta-analysis.The Lancet, 369(9576), 1876-1882. Go, A. S., Hylek, E. M., Chang, Y., Phillips, K. A., Henault, L. E., Capra, A. M., ... & Singer, D. E. (2003). Anticoagulation therapy for stroke prevention in atrial fibrillation: how well do randomized trials translate into clinical practice?. Jama, 290(20), 2685-2692.